1850: born in Edo in the district of Asakusa Saruwaka-chô. 5th lunar month of 1866: his father Ichikawa Kodanji IV dies. 2nd lunar month of 1867: he makes his first stage appearance at the Ichimuraza, where he receives the name of Ichikawa Nedanji I and plays 2 roles in the drama "Keisei Soga Kuruwa Kagami". 10th lunar month of 1872: premiere at the Moritaza of Kawatake Shinshichi II's zangirimono "Tsuki no En Masu no Igaguri"; Nedanji plays the role of Kômori no Yasuzô [casting]. June 1876: premiere at the Shintomiza of Kawatake Shinshichi II's drama "Hototogisu Date no Kikigaki"; Nedanji plays the roles of Kamura Tsuboki-no-Kami, Kurata Jingobei and Kondô Tatewaki [casting]. June 1878: Ichikawa Nedanji I takes the name of Ichikawa Kodanji V at the Shintomiza, playing in the drama "Matsu no Sakae Chiyoda no Shintoku". October 1878: premiere at the Shintomiza of Kawatake Shinshichi II's drama "Jitsugetsusei Kyôwa Seidan"; Kodanji plays the roles of Hoshiemon's henchman Senta and Ôzakaya Senkichi [casting]. February 1879: premiere at the Shintomiza of Kawatake Shinshichi II's drama "Ningen Banji Kane no Yo no Naka"; Kodanji played the role of Seizaemon's daughter Oshina [casting]. 16 July 1879: Kodanji takes part in the gala night at the Shintomiza in the honor of the General Ulysses S. Grant [more details]. March 1881: premiere at the Shintomiza of Kawatake Mokuami's masterpiece "Kumo ni Magou Ueno no Hatsuhana"; Kodanji plays the roles of Kurayami no Ushimatsu and Miyazaki Kazuma [casting]. June 1881: premiere at the Shintomiza of Kawatake Shinshichi II's jidaimono "Youchi Soga Kariba no Akebono" [casting]; Kodanji plays the role of Gosho no Goromaru Fuyuyasu. Premiere in the same theater of Kawatake Shinshichi II's dance-drama "Tsuchi Gumo", which is staged to commemorate the 32nd anniversary (33rd memorial service) of late Onoe Kikugorô III; Kodanji plays the role of Watanabe Tsuna [casting]. August 1881: tour in Toyohashi; he meets up with his brother Ichikawa Udanji I.
September 1881 ~ Spring 1883: Kodanji performs in Kamigata with his brother. Spring 1883 ~ November 1883: Kodanji performs in Tôkyô in both the Harukiza and the Shintomiza. December 1883: tour in Nagoya. March 1884 ~ June 1885: Kodanji performs in Kamigata with his brother. 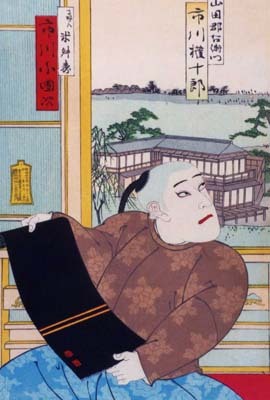 July 1885: Kodanji is back in Tôkyô and performs at the Shintomiza. May 1888: première at the Chitoseza of Kawatake Shinshichi III's drama "Kagotsurube Sato no Eizame"; Kodanji plays the roles of Jiroku and Shigeyama Einojô [casting]. March 1890: premiere at the Kiriza of Takeshiba Kisui's drama "Kami no Megumi Wagô no Torikumi"; Kodanji plays the role of tobi Utagawa-chô Chôjirô [more details]. July 1890: premiere at the Shintomiza of "Kiyomasa Seichûroku", a revised version of Kawatake Shinshichi III's 1875 drama "Minori no Aki Seishô Denki". It was part of a special 2-day gala program starring Ichikawa Danjûrô IX; Kodanji plays the role of Ikeda Terumasa [more details]. November 1893: Kodanji takes part in the opening ceremony of the Meijiza [more details]. October 1898: premiere at the Meijiza of Takeshiba Kisui's dance-drama "Sannin Katawa"; Kodanji plays the role of the blind man [casting]. March 1899: premiere at the Meijiza of the drama "Kurotegumi Kuruwa no Tatehiki", which gathers the main scenes from the sukerokumono part of Kawatake Shinshichi II's 1858 drama "Edo Zakura Kiyomizu Seigen"; Kodanji plays the roles of Ushiwaka Denji and Kinokuniya Bunzaemon [casting]. January 1914: revival at the Hongôza of the drama "Gedatsu", a long-forgotten play belonging to the Kabuki Jûhachiban; Kodanji plays the role of Kajiwara Heizô Kagetoki [more details]. Ichikawa Kodanji V was a Meiji/Taishô actor, able to play both tachiyaku and onnagata roles. His forte were jitsugotoshi roles. Less brilliant than his amazing father Ichikawa Kodanji IV, he focused on classic dramas and was not involved in any of the reformist experiments which shook the Kabuki world.